Teaching is full of surprises. My kids are always keeping me on my toes. They're not always to blame, though. For those of you who don't know, Drumright is a boom town. Oil was hit in 1912, and the town was born. The high school I teach at opened its doors in 1919! 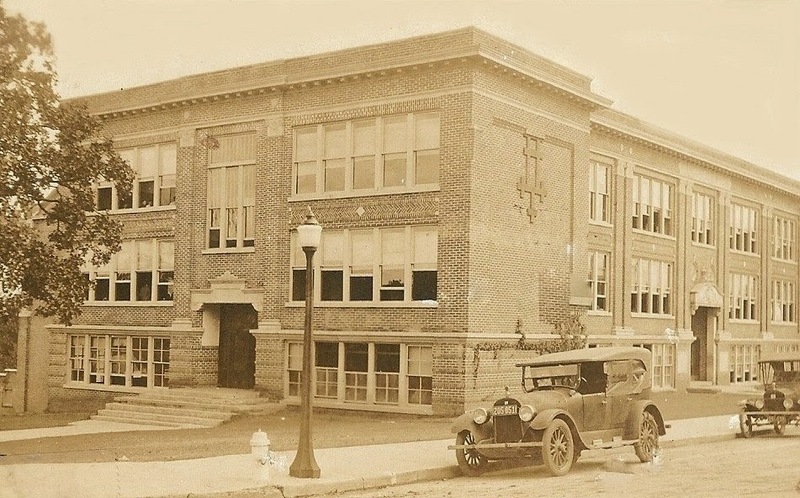 Recently, our local historical society posted a picture of the school from 1919 on their facebook page. I decided to take my own picture, just to compare. Here's my school, soon after it was opened. My classroom is the closest classroom to you on the second floor on your left. And, here's what my school looks like now. The North addition was added to make the school handicap accessible. It houses an elevator and bathrooms on each floor. Why am I showing you pictures of the building I work in? I'm hoping it will explain what I'm about to show you. Remember how I said teaching is full of surprises? Old buildings are especially full of surprises! I had one of those experiences today. I was sitting at my desk, grading papers. It was late, and I was getting ready to head home. The history teacher from across the hall came over to tell me something. I stood up, and my eyes were drawn to a stain on the carpet. Except, it wasn't a stain. It was something that was alive. It was a BAT!!! Now, I've known that my school had bats since I started working here. When the counselor gave me keys to my room, she warned me to beware of the bats that lived in the school. Twenty-one months after hearing about the bats for the first time, I finally saw one. In my classroom! This is not okay. Bats do not belong in my classroom. They belong in caves. I think the only time I've actually ever seen a bat in real life before was in Marvel Cave at Silver Dollar City in Branson, MO. Thankfully, the history teacher stepped into action. He got a broom, and used it to poke the bat. Nothing happened, though. It just continued laying there. I know the bat isn't dead, because it moves its head every once in a while. I think that it may be sick and/or dying. Why else wouldn't it move when it got poked by a broom? I also know that I do not want to get bit and have to go get a rabies shot! I left my door open. We'll see if the bat is still there in the morning. I'm hoping that he will have disappeared by morning. If not, I'll definitely be covering him with a bucket or trash can until the custodian or anybody but me can come and transport it from my classroom. Let me set the stage so you can see where this falls in my Algebra 1 curriculum. At this point in the year, my Algebra 1 kiddos have reviewed the pre-algebra basics of the real number system, integer operations, and the order of operations. We learned exponent rules and named polynomials. We're experts (hopefully) at distributing and undistributing (factoring) expressions. Equations have been written and solved. Inequalities have been solved and graphed (in one variable.) Students have learned the definitions of relations and functions. We've also discussed domain and range and independent and dependent variables. We can graph points on the coordinate plane. It's now time to delve into function notation, expand on the idea of a function machine, and graph functions by making an input/output table. We haven't discussed slope or looked at the difference between linear and non-linear functions. Those will come in the next unit. When we discuss how to differentiate between a relation that is a function and a relation that is not a function, I introduced the concept of a function machine. Humans like functional machines. We like to be able to predict what's going to happen. When we put bread in our toasters, we expect toast. If we put a toaster strudel in our toaster, we expected a warm, toasted toaster strudel. If we put a bagel in our toaster, we expect a toasted bagel. Because we know the function of a toaster (to toast things), we can predict the output based on the input. After introducing the concept of a toaster as a function machine, I ran across an amazing comment on Sarah Rubin's Everybody is a Genius blog. The comment was from Ms. Mac/Mrs. G. And, she suggested showing students that a toaster allows several inputs with the same output. But, it doesn't allow one input to have several outputs. For example, if I put wheat bread in my toaster, I get out toast. If I put rye bread in my toaster, I get out toast. If I put pumpernickel bread in my toaster, I still get out toast. (I've never actually eaten rye bread or pumpernickel bread. I guess I need to get out more!) But, if I put in a bagel, there is no way that I could ever get anything but a bagel out of the toaster. There is zero possibility of getting scrambled eggs or a waffle. Every input has exactly one output. I love this addition, and I think it will really help my students. I'm definitely adding this to my unit next year! I guess I made a pretty big deal out of my toaster analogy before Christmas. After Christmas break, I asked the following question without really thinking about the whole toaster thing. Me: "Guys, I brought some function machines from my house today. Don't you have function machines at your house?" Student: "Did you bring your toaster?" Me: "No... I guess a toaster is a function machine, but I brought a different type of function machine today." Now, remember the flip chutes I made this summer? They are made out of saltine boxes. Though, I'm pretty sure I was supposed to make them out of empty juice cartons. They've been sitting in my house for months, just waiting to make their debut in this lesson. Me: "Humans love to name things. We have an obsession with naming the things around us. We name our children. We name our pets. We name our cards." A Fourth Student: "I named my straightener." So, apparently, humans like to name things even more than I realized! Mathematicians like to name things, too. After all, they are humans. Mathematicians are also fans of parsimony. If they name something, they want to name it in the easiest and shortest way possible. Therefore, usually the name of a function is notated by a single letter of the alphabet. The word function starts with f, so a lot of times, mathematicians simply call a function f.
I have to function machines, so I named one f and the other g. To further emphasize that f and g are just the name of the function, I gave them more traditional names, too. Francine. And George. After I gave them these names, I realized that these are both the names of characters on Arthur. I loved to watch Arthur when I was growing up. I can remember being so scared of going to the third grade. I mean, what if my teacher ended up being as mean as Mr. Ratburn? Okay, enough with the reminiscing. Once I realized that I was channeling Arthur with my names, I made a comment about it to my students. Me: "I guess I'm channeling Arthur today." Me: "You know! Arthur, the aardvark." Me: "Have you really never seen that show on television?" Student 2: "Oh, I know what show you're talking about! What did you say he was again?" Me: "Arthur was an aardvark." Student 2: "He was an aardvark?!? I always thought he was a bear!" I didn't realize that giving my functions names was going to lead to so many issues. My 6th period class decided to rename George as Georgeio. Another student came in at lunch to give me her opinion on the names. "The function machines should be named George and Francisco. Then, they can be gay, Italian lovers. Italians make the best lovers. I know this." I didn't even respond to that comment. I did not want any more details. And, let's not forget to mention the fact that Francine is taller than George. One of my classes assumed that George and Francine were dating. And, Francine is taller than George. The girl is taller than the guy. Oh, what outrage! Next, it was time to take some notes over function notation. These notes were heavily influenced by (read: stolen from) Everybody is a Genius. We labeled each part of a function in function notation. And, then we practiced evaluating functions using a function machine. I'm going to be really honest. After going over the parts of a function, my Algebra 1 kids were VERY confused. But, after we worked through the two examples with the function machines at the bottom, light bulbs started going off. "Oh, that's what that means!" Inside the foldable, students were given two new functions to evaluate for various inputs. I included some problems where students added functions and found the composition of functions. Normally, I would have skipped over these because they are not tested in Algebra 1, but I'm slowly starting to work in increasing the rigor of my Algebra 1 class in preparation for Common Core. I also included two problems at the bottom where students had to evaluate the function for a different variable. On the right side of the inside of the page, I include 3 sample EOI questions for students to solve. I want my students to be familiar with how the questions will be phrased on their end-of-instruction exams. This took probably 2/3 of our 50-minute class period. For the last third of class, we started a hands-on activity using my shower curtain coordinate plane and the function machines. Before class, I prepared five pairs of functions. Each pair of functions f and g were written on a post-it note. Since I have a limited domain and range on my shower curtain, I prepared cards for each ordered pair of the function that fit my restricted domain and range. Here's a close-up of the cards in one bag. The post-it note is a reminder for me. It tells me what functions to write on the SMART Board. One one side of the cards (cut out of card stock), students are told what to solve for. For example, if a student picks up a g(2) card, they know that they are finding the output that results from putting 2 into g. The resulting output is written on the other side of the card. To give students an element of choice, I laid out all of the cards on the desk. Students were instructed to pick a card up off the desk and return to their seat. At their seats, they have calculators, dry erase boards, markers, and erasers. The students were to evaluate the correct function for the given value of x. Students choose a card to evaluate. If a student picked up the f(3) card, they would return to their seats and substitute 3 in for x in the function f(x) = 2x-3. They should get an output value of 2(3)-3 = 6-3 = 3 if all their work was done correctly. Once they have an answer, they must go back to the function machine and feed the problem to the function machine. This is their input. They feed the input into Francine because they were asked to plug the 3 into f.
Putting the card into the function machine. This is where things get cool. Upon placing the f(3) card in the function machine, the function machine will flip the card over so that it comes out reading 3. To the students, it is MAGIC! I would LOVE to set up a video camera to capture my students' faces the first time they put a card in the function machine. Their expressions are priceless! Of course, they soon realize that the answer is written on the back of the card. And, all the function machine does is flip the card over. Even after discovering how it works, they still seem to love it. I might have seen one or two kids all day forgo feeding their cards into the function machine and just flip it over to check their answer instead. After checking their answer, students now had to graph their input and output as an ordered pair on the coordinate plane. My giant coordinate plane was put in the floor for this activity. To plot the points, I created points out of some giant foam stars that my sister had given me. She had used part of them for an art project. To further emphasize function notation, I labeled the stars with generic ordered pairs. (1, f(1)) or (5, g(5)). I was hoping that students would make a connection between the fact that f(0) means the output of f when the input is 0. I guess I didn't do the best job of explaining this on Day 1 because my students did really well until we got to the graphing part. Instead of nice linear functions, our attempts usually ended up looking a little something like this. After graphing each point, students picked up a new card and repeated the process. They placed the cards that had been graphed on top of the function machines to avoid further confusion. Once all the ordered pairs had been found and graphed, we had a class discussion. Students discard cards after evaluating and graphing. What stars look like they are in the wrong place to you? A student would pick a star that they believed was incorrect. And, as a class, we would evaluate the function for that value and determine the correct place for it to go. Sometimes the star had been placed correctly. Most of the time, however, students made the exact same mistake. (3, f(3)) would be placed on (3, 3). (-2, g(-2)) would be placed at (-2, -2). Students were seeing the input of the function and were confusing that with the output. Here's an example of some mis-placed stars. Eventually, after some hard work, we concluded that all the stars were now in their right places. Students were shocked to discover that the points formed two lines! Will this always happen? Students were convinced that sometimes they would make lines. Other times they would make X's. After graphing one pair of functions, time was up. I felt like we had made some progress, but I knew we had so much more to go. Enter Day 2. We started off class by watching the Meat-A-Morphosis: An Introduction to Functions video from youtube. If you haven't seen this video before, take seven and a half minutes and just do it! I told my students that we were going to watch a movie, and they were instantly excited. I show lots of math songs and short youtube clips, but I tell my students that I don't believe in movies. They think that we should be watching feature films before every single holiday. Ummm....no. I have way too many exciting mathematical things to share with them. I don't have time for us to watch Finding Nemo. They soon realize that we are watching another math video, so their excitement fades. When the music starts, the complaints start up again. "How old is this movie you're making us watch?!?" "I don't know. Just watch and see." The girls ooh and aah over how cute the little chickens are. The class collectively gasps when the (spoiler alert) chickens are chopped up to make chicken nuggets. "Why are you showing us this?" "Wait! You're a vegetarian. Why are you showing us a video about meat?" "Guys! I think she's trying to turn us into vegetarians!" No, I'm trying to turn you into mathematicians. At the end of the video, one particularly opinionated student said, "Some of the things I see in here scare me." At this point, I'm still frustrated over my students' struggle with function notation from the previous day. How do I fix this? I know! We'll do an example problem, and I'll force them to use function notation an obnoxious number of times! I gave the class a function to graph in function notation. And, I also gave them their inputs, the integers from -5 to 5. Students had to write the output in function notation, the output as a number, the ordered pair in function notation, and the ordered pair using only numbers. We did the first two lines of the table. Then, I gave students several minutes to work. We would check their work, and they would continue on. It was time-consuming, but I think it was a positive learning experience. It was awesome to see students start to make connections. Some realized they could very easily fill in the function notation columns. Others noticed that the numerical output increased by two every time. I walked around the room, pointing at student work, congratulating them on finding patterns. We graphed the ordered pairs, and they formed a line! With about fifteen to twenty minutes in class, we once again tried graphing functions using the function machines, cards, stars, and shower curtain coordinate plane. When students looked confused, I reminded them of the function notation we had just used earlier that day in our notebook. That seemed to help some. But, I still had some very frustrated kiddos who could not figure out how to pick out which star to use or where to place it on the coordinate plane. I was starting to write off this whole exercise as a failure. Maybe I am just terrible at teaching function notation. Maybe my kids are just doomed to never understand this. I wasn't about to give up, though. My students were going to understand function notation one way or another! The next day, I decided we were going to spend our entire 50-minute period graphing functions. If we continually graphed, checked our work, discussed discrepancies, and tried again, they were bound to have to get it! I had students open their notebooks to our pages on function machines and function notation to use as a reference. My students were rocking the process of evaluating the functions. They were checking their answers using the function machines. Life was good. Well, life was good until they got to the stars. I decided to just position myself by the stars and help students with the graphing process. They were going to get this! After helping student after student find their correct star, I had an epiphany. They already have the card in their hand that has the output written in function notation on one side and the output written in numerical notation on the other side. Why don't I have them use this card to graph their ordered pairs?! My conversation with students went something like this. Student: "I can't figure out which star I need!" Me: "Well, what was your input?" Student: "My input was 2, and my output was 1. But, I don't see a star labeled (2,1)." Me: "Do you remember how we had two different ways of writing the output in our notes?" Me: "Well, if your card says f(2), you need to find a star that also has f(2) in the ordered pair." Problem solved. Find the star that matches the card. This was great except for the fact that they still wanted to put the (2, f(2)) star on (2, 2). Every. Single. Time. It was time for a second epiphany. Me: "So, your output was f(2)?" Me: "And, what was the numerical output that you got when you plugged 2 into the function?" Student: "When I plugged in 2, I got 1." Me: "So, f(2) is 1?" Student: "Yes, I just said that." Me: "So, you're saying that f(2) is equal to 1?" Student: "Yes. f(2) equals 1." Me: "If f(2) equals 1, then I can replace the f(2) with 1. And, that will tell me where to graph the ordered pair." At this point, I made a show of flipping the card over several times. I would show them that (2, f(2)) was the exact same as (2, 1). After all, they had just told me that both sides of the card meant the same thing. All of a sudden, my students were graphing points like nobody's business. They didn't need my help to find their stars. And, they certainly didn't need my help to graph their ordered pairs. It was so fun to watch them match the cards with the stars and then lay the cards on top of the stars. They would flip the card over just like I had shown them in order to graph their ordered pair. Success! So, why do I love this lesson so much? It's hands-on. It got my kids out of their seats. It was self-checking. It was a safe environment to make mistakes. When students point out that they think (3, f(3)) is in the wrong place, nobody knows who graphed that point unless the student announces that it was their star. Each student worked at their own pace. It was discussion-provoking. Students were craving vocabulary words like slope and y-intercept that we had yet to learn. They were asking questions, making predictions. "I bet this one makes a line, too!" After, we graphed a quadratic, one student wanted to know how he could tell from the equation if the graph would make a straight line or a parabola. I also felt like I could differentiate this activity for my students. If f(x) was a quadratic and g(x) was linear, I could push my advanced students toward solving the f(x) cards, and my students who needed more support could be further practicing linear functions with the g(x) cards. Basically, I want this to be what my classroom is like every single day. One of the first things we did after learning to graph quadratic functions was to discuss what it means to solve an equation. We completed a Frayer Model for the phrase "Solve A Quadratic Equation." This year, I am using the TI-Nspire graphing calculators with my Algebra 2 students. As someone who was trained to use a TI-84 in high school and a TI-89 in college, this has been a big change for me. But, I've learned to love the Nspire. I have yet to decide which calculator I will use with my students next year as we transition to Common Core, however. I typed up these steps for my students to glue in their notebooks in case they forgot the process to find the solutions graphically. We did four problems together as practice. If you would like to download my Quadratic Function files, click here. I know this is math, but what kind of math is it? I found this problem worked out on my dry erase board. It was so interesting that I had to take a picture of it before I erased it. I'm assuming it has something to do with agriculture. I'm basing this off the notations for corn and (I think) alfalfa. Has anybody ever seen anything like this? I'm just intrigued by it. Daily, I am learning how to be a better teacher. I know what worked well for my students last year. And, I know what didn't work so well. Last year, I assumed that if I taught my students the definition of a linear function, they would be able to apply that definition and use it to find the missing value of a function. I assumed incorrectly. Last year, I taught my students the vocabulary, but I didn't give them the practice they needed to be successful with this type of question on our end-of-instruction exams. I decided this year was going to be different. Instead of spending 15 minutes discussing linear vs. non-linear and then moving on, we spent an entire class period working with linear and non-linear functions. We started out by creating a frayer model for linear functions. I provided students with the definition and characteristics. They worked together, as a class, to create their own examples and non-examples. In almost every class, one student would suggest that a vertical line was an example of a linear function. It was a happy teacher moment for me when another student would realize and explain to the class why the vertical line belonged in the non-example box. Student propelled discussions are awesome! I need to have more of them in my classroom. Next, I gave my students a sheet of problems to cut apart. The first thing we looked at was a set of tables. Students were tasked with determining if the table represented a linear function or a non-linear function. This was the perfect opportunity to use color with a purpose. Students used one color of marker to find the rate of change between the first two lines in the table. Students used a different color of marker for the rate of change between the second and third lines in the table. And, they used a third color to find the rate of change between the third and fourth lines. In retrospect, I should have given my students more of these tables to practice with. But, we moved on next to some practice EOI questions. These are the questions that I had just assumed in the past that my students would be able to solve on their own. We practiced finding the pattern / rate of change. And, we extended the tables as necessary to find the requested values. I'm really glad I printed these questions off and had my students glue them in their notebooks. This allowed students to write all over the questions without having to worry about copying down the questions. Is this teaching to the test? Yes. But, I think it's more than that. This is me equipping my students with tools that they need to be successful. Students have to be taught to organize their work. They need to see different ways to approach problems. As we worked through these problems together, discussion naturally happened. In some classes, a few students would realize that we could take a short-cut that would keep us from having to draw extra lines on our tables. Part of the class would use the short-cut. The rest of us would write out the process, step-by-step. We would compare answers and discuss why the short cut worked. Last year, my students would panic when they would see problems like this. This year, they view them as a sort of puzzle that they have the tools to figure out. I view that as a win! I'm so sad to be finished with conic sections. I just love them that much. My students, on the other hand, are quite glad to be done with conics. We've moved on to sequences and series in Algebra 2, and I have a lot of students who are in love with that chapter. I'm just excited to see them excited about something! Here is what our interactive notebooks ended up looking like for conic sections. As always, the unit began with a table of contents. I actually taught parabolas as part of Unit 6 - Quadratic Functions. So, the page of formulas for parabolas was actually found in the last chapter of their notebooks. I'm going to go ahead and include that page as if it was in the Conic Sections Unit. I posted about it earlier, but I gave my students a flow chart from Rebecka Peterson to help them identify which conic section corresponded with a given equation. The formulas and information I gave students were taken from Cindy Johnson's Conic Cards. The conic card file contains cards for the students to use that have these formulas on them. But, I decided I wanted my students to have something in their notebook to reference this year. I like how these pages turned out, and I'm thinking of doing away with the information cards altogether next year in the conic card decks. Next, I made a booklet foldable for my students to practice graphing 9 parabolas in. Students had to identify how the parabola opened and the vertex of the parabola. Then, they sketched the graph. Here's what the inside of the booklet foldable looked like. These were graded for accuracy as part of their notebook check. I have attached the files below. The formulas for the practice problems were not written in, so you could give students any parabola equations that you choose to. Next up, circles! We took notes over the formulas for circles. And, students got lots of practice graphing circles in their booklet foldable. Here's a close-up of the example circle I graphed with my students. I really, really, really should have used a compass! Students were required to identify the center and radius of the circle in addition to graphing the circle. Here are our two pages on circles, side by side. We explored ellipses next. As always, we started off by looking at the formulas for ellipses. We graphed nine different ellipses for lots of practice. Here are the two ellipse pages, side by side. And, here's a close-up that details how I showed students to graph their ellipses. I tried to employ Color With a Purpose (CWP) here. I wrote the center in blue and graphed the center in blue. I wrote the a value in orange and used the orange marker to show how to use the a value to find points on the ellipse. I did the same thing with the b value. Last, but not least, we explored hyperbolas. Hyperbolas are my least favorite conic section. I didn't want my prejudice against hyperbolas to rub off on my students, so I actually told my students that hyperbolas were my favorite conic section to graph. I'm not sure how convincing I was, but I did hear some students remark that hyperbolas weren't as hard to graph as they first imagined them to be. Here are the formulas for hyperbolas. There was barely enough information on our Hyperbola Practice booklet foldable to write out the information needed to graph each hyperbola. But, we made it fit! Here's a close-up of my beautiful hyperbola. I make my students identify the center, a value, b value, asymptotes, and vertices of each hyperbola before graphing. I have found that students do a much better job at graphing if they have identified this information beforehand. Here are the two pages we made for hyperbolas, side by side.